Your cat may want to go outside, but the outside world can pose a lot of hazards for your pet. Cat-proofing your fence can help you keep your cats on your property while also ensuring that stray felines cannot gain access to your yard. You do not want stray cats in your yard because they may fight with your own cats or spread diseases to your pets. Combine several different methods of cat-proofing in order to create the most effective feline barrier possible. Locate all holes in your existing fence that are large enough for a cat to fit through. Repair these holes or cover them with fresh fencing so that your fence is solid and your cat can not wiggle through any gaps in it. Install a second fence line that will run along the inside or outside (or both) of your existing fence line. The second fence line is made to be highly flexible and not feel sturdy enough that your cat wants to climb it. Creating this barrier requires you to fasten gardening mesh or chicken wire along the same fence line as your existing fence line. 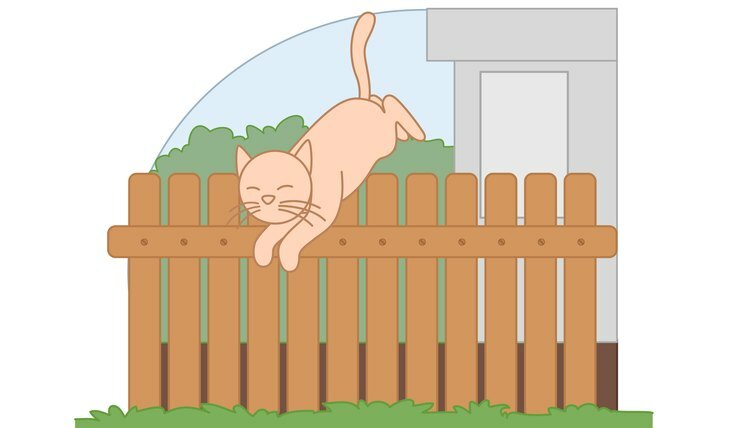 The new fence should be just far enough out from the existing fence that the existing fence will not stabilize it enough that your cat will feel comfortable when he tries to climb it. You can create this fence line by putting up new posts or by fastening extenders that stretch outwards to your existing fence post. You will hang the mesh from the new post or the extenders. The new fence should feel wobbly when your cat goes to climb it. It should be at least 4" high to prevent cats from jumping over it. Place angled fence extenders across the top of your fence and run mesh across this extended section. 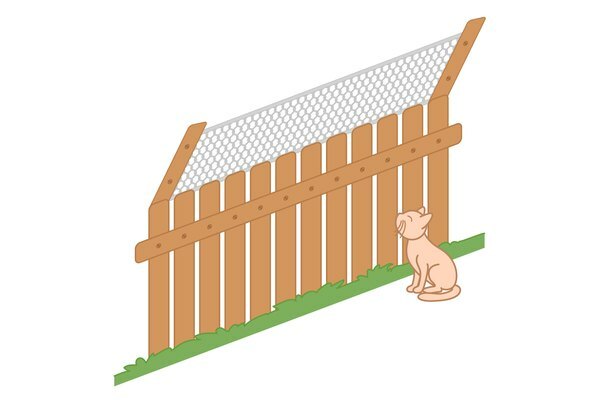 This will ensure that a cat who climbs your fence will wind up climbing backwards and outwards from the fence, making them highly unlikely to successfully get over the fence. Remove climbable objects from the area near your fence. Your fence will do little good if your cat can climb a nearby tree as a method for escaping from it. You should remove any items that your cat can climb from the immediate proximity of your fence. 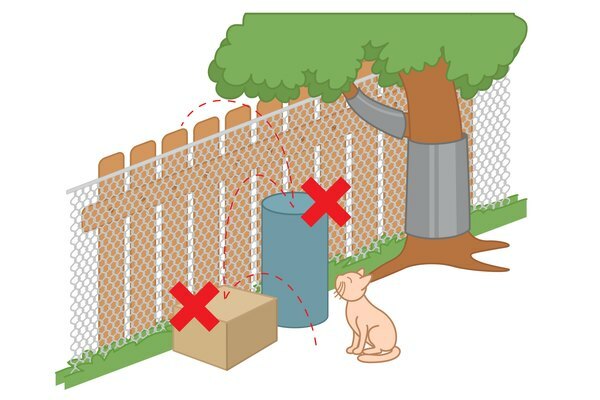 Place objects such as trash cans and ladders out of jumping distance to ensure no cats climb the trash can and then jump over the fence. If you do not want to cut down your trees, you can wrap your trees in aluminum flashing to keep cats from climbing them. The side of your fence that you cat proof should depend on whether you want to keep your cats in or stray cats out. 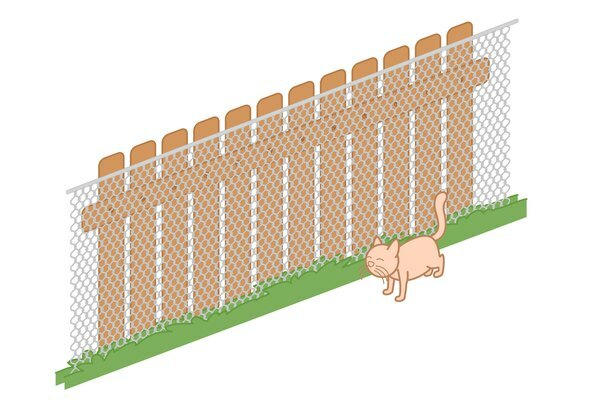 You may have to try multiple solutions in order to keep your cat in a fence. 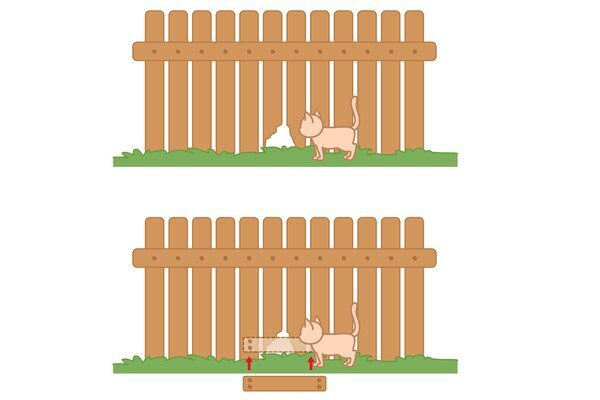 It can be very difficult to keep cats in a fence if they really want to get through it. Some cats may be more difficult to keep from escaping than others. If you cannot find a way to safely contain your cat, it is best not to allow him outdoors at all.